Die Co. J-nuts can attach two sheet-metal panels quickly and easily – in place of welding. 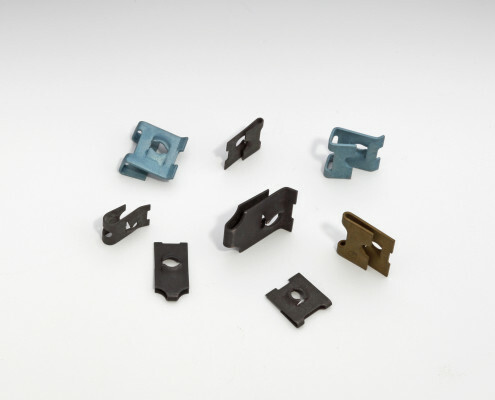 The nut clips to the edge of one panel and stays in place as a screw is driven into the J-nut, securing the panels to each other. An extrusion on the J-nut’s retaining leg grips the mounting hole, keeping the nut affixed to the adjoining panel. J-nuts allow movement to accommodate panel misalignments. J-nuts weigh less than other fasteners, yet still provide a strong, reliable hold. No special skills or tools are required for installation or removal. Browse the selection of Die Co. J-nuts in our product catalog, contact us to customize a J-nut for your application or check for a competitor part on our cross reference list. Learn more about Die Co. J-nuts and find part numbers in our product catalog or check for a competitor part on our cross reference list. Email a Die Co. representative – or call 440-942-8856 – and tell us what you need. One of our fastener experts can help you find or design the best J-nut for your application.